Weddings can be tremendously exciting, but attempting to plan such an event can be a very daunting task. If something is left out or a mistake is made, the experience can be downgraded to some degree. Although some mistakes are ignorable, messing up a guest’s meal might not go over so well. It would be absolutely tragic to provide a vegetarian with a big T-bone steak. With this in mind, you should consider taking full advantage of a wedding menu template to help decrease the probability for flaws. Below, you’ll learn more about this item and how it can help you, during the wedding planning process. When compared to other types of menus, the wedding menu is truly simplistic. This type of document simply displays all of the food choices that will be made available at your upcoming wedding. Generally, the menu will first display the starter items, before showing the entrees and sweets. 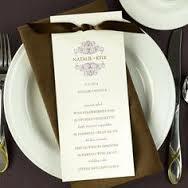 It is possible to personalize the menu to perfectly match your wedding’s theme and color scheme. You can even add the name of the bride and groom to the menu for a more personal touch. The possibilities are truly endless and you should allow your creativity to flow. Regardless, the menu serves the same purpose and helps to guarantee that all guests are familiar with the foods they can order. There are truly many brides and grooms, who will desire to maintain in complete control over their wedding. If you fall into this category, you’ll need to take on an abundance of responsibility. One of the most difficult aspects of all will be ensuring that all of your guests are able to acquire delicious foods that they’ll be able to enjoy. Utilizing a wedding menu template can make this tremendously easier. By crafting the menu and providing it to your guests ahead of time, they can go ahead and place their orders. This will also help to ensure that the catering company will be able to deliver the meals with extreme efficiency and without a long wait. There is definitely a lot of money to be made from catering weddings. If you operate a catering company, you will likely agree that wedding catering can equate to big earnings. Of course, these events are a tad more delicate and require extreme precision. The bride and groom will want to keep everything absolutely perfect and the catering company will not want to get on their bad side. Once the bride and groom have finalized their menu, the catering company will be able to utilize it to their advantage. By taking orders a few days or weeks in advance, the catering company will already know precisely how much of each entrée is needed. This will give them a much better chance of bringing along just enough supplies to cover everyone’s needs. The menu will also help to dramatically reduce the probability of mistakes. Although weddings are incredibly special and memorable, they can also be very stressful for various individuals, including the bride, groom and their help. Sometimes, it is possible to take simple steps to greatly diminish the potential for major problems. A wedding menu can do just that! If you’re currently planning a wedding or will be catering one in the future, you should make sure to download the template and use it to your advantage!